The Hinckley-Jardine family invites you to consider making a donation to Friends of Green Lake in memory of their brother and son, Taiga Hinckley. 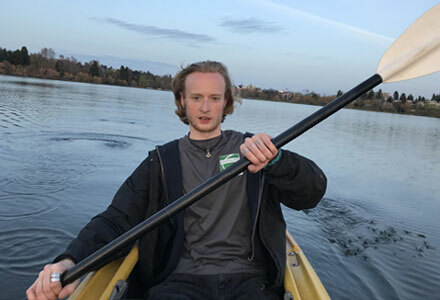 Taiga was a junior at The Evergreen State College, earning a Bachelor of Science degree, and spent his summers working at the Green Lake Boathouse. One of his favorite activities was kayaking and spending time on the lake, and he was a beloved fixture in the neighborhood. Please visit the family’s GoFundMe page here to make a donation and help secure a healthy Green Lake for generations to come. 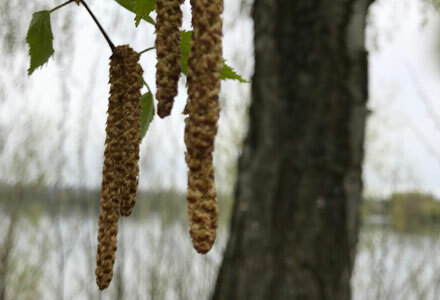 Nothing says spring like an explosion of beech catkins and an eruption of volunteers at a Green Lake Work Party. Join us. We will be weeding and mulching our westside restoration area just a stroll north of the Small Craft Center. As usual, this will be dirty work, dress appropriately. Wear close-toed shoes. Bring a bottle of water. Monitored weekly by Jeffrey Howard at East Green Lake from the T-dock near the Green Lake Community Center. 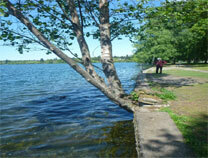 The weekly data are reported quarterly and uploaded to the King County Lakes website available here. Select “Green-1” and “View Data”. General lake information, water quality data, and reports are available here. Green Lake Park Users Helping the To Do List Get Done! At the Friends of Green Lake (FOGL) meeting on January 26, 2016, FOGL was joined by several staff from the Seattle Department of Parks and Recreation (SDPR). At the conclusion of the meeting it was suggested by SDPR that FOGL prepare a list of items we felt should be addressed in the Park. Alder tree growing between blocks of the shoreline wall on east shoreline. The To Do List identifies issues or problems, provides location information if appropriate, and suggests possible corrective measures. Where possible, one or two photographs are included to illustrate the issue/problem. FOGL hopes that the “To Do” List will stimulate discussions about the needs of Green Lake Park and we hope to participate in these discussions. We expect other Park users will join in these discussions. YOU’RE INVITED! JOIN US AT 7 PM TUESDAY MARCH 26, 2019 AT THE FRIENDS OF GREEN LAKE MEETING AT THE HEARTHSTONE. Hope to see you Tuesday March 26! We are meeting in the board room at The Hearthstone, 6720 E. Green Lake Way North, from 7 – 9:00 PM. Next meeting will be on May 28, 2019. THANKS TO THE HEARTHSTONE FOR HOSTING OUR MEETINGS! Minutes for previous meetings are being posted in the blog, retroactively. Click here for a minutes-only archive.